The Franklin Corporation is a full service commercial general contractor located just outside of Bellingham, Washington. We work with both the Private and Public Sector specializing in Adaptive/Reuse and Redevelopment, Healthcare Construction, Tenant Improvements, New Commercial Building, and the LEED Building Process. In addition, we provide construction and project consulting services throughout the western half of the United States. In our 30 years of existence, our reputation has been built on a being a straight forward, honest Commercial General Contractor who upholds the highest quality and standards. We’ve assembled a team of skilled, professional Project Managers, Architects, Subcontractors, and Craftsmen, each working together to deliver the best product possible to our clients. So whether you have a medical office remodel or a complicated redevelopment, we have the project management experience and the best construction resources available to complete your project on-time and within budget. 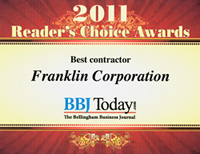 The Franklin Corporation received the Bellingham Business Journal 2011 Reader's Choice award for "Best Contractor". We wish to thank our employees, subs, suppliers, and most of all our clients for their continued support and dedication. 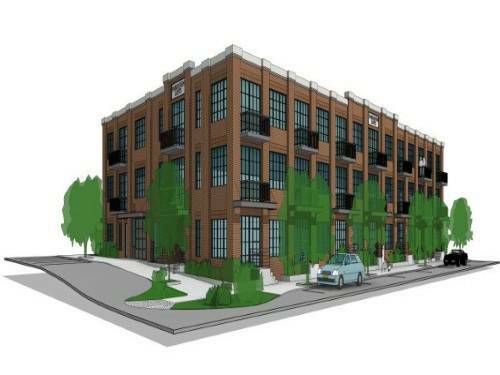 The recently completed Fairhaven Lofts is a high-end, 3-Story Apartment complex located on the Southside of Bellingham WA in a historical district. The 38 units allow for maximum daylighting and the interiors are complete with custom finishes and high-quality appliances. Many of our past partners and clients have volunteered their recommendation for working with The Franklin Corporation. Above is a sampling of their individual testimonial. If you wish to to view the Individual Testimonials, click here to go to the Testimonial Page. If you like us, please follow us on Facebook! Copyright ©2009 The Franklin Corporation. All Rights Reserved.